I know it might seem like we’re picking on plastic lately, but the facts are there: plastic waste is a major problem. Contributing from everything to bursting landfills, floating garbage islands in the middle of the ocean, and the leaching of toxic chemicals back into ground and water tables, the material that once revolutionized packaging is now sealing our (and our world’s) demise. But not everyone’s content with that fate. Plastic alternatives have been cropping up over the years in droves, searching for an eco-friendlier answer to this non-degrading dilemma. As sustainability thrives on creative applications of new or existing technology and materials, artists and designers have heeded the call, dreaming up ways to solve the problem. While the more scientifically-inclined Icelanders might be content with (literally) burying the culprits behind global warming, design student Ari Jónsson presented a solution at Reykjavik’s DesignMarch expo this year that’s really something to chew on. From nothing more than red algae powder and water, Jónsson has created a 100 percent natural, biodegradable algae water bottle that decomposes when you’re done using it. Of course, if you like the taste, you can just eat it too. Since plastic is prized for its dual flexibility and sturdiness, those same characteristics are what make it so environmentally dangerous. While it does a great job keeping foods fresh and safe to eat, plastic containers take about a thousand years to decompose naturally. During this time, the same chemicals that make up the bottle are breaking down back into the ground or released back into the atmosphere — or, choking and poisoning wildlife unfortunate enough to eat the plastic left behind. Jónsson felt something needed to be done: “I read that 50 percent of plastic is used once and then thrown away so I feel there is an urgent need to find ways to replace some of the unreal amount of plastic we make, use, and throw away each day. Why are we using materials that take hundreds of years to break down in nature to drink from once and then throw away?” So, like anyone upset enough by something, he got to work. Using algae powder isn’t unique to Jónsson’s bottle. 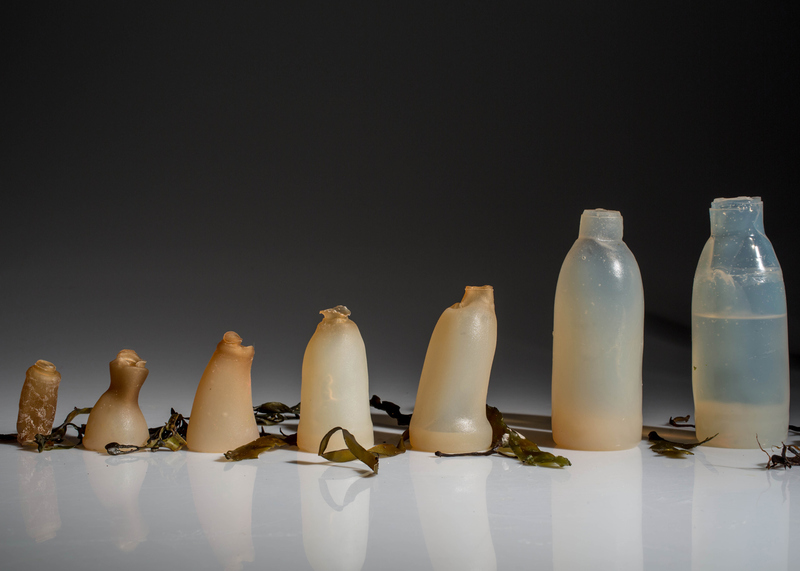 Agar (the name for the derived algae powder) has been used in similar sustainable/edible packaging concepts; seaweed has been used in a variety of industrial applications, from weaving rugs to creating lampshades. In forming his bottles, Jónsson combined the agar with water to create a gelatin-like substance which he then poured into a mould he pulled from the freezer. After submerging the filled mould in ice water and hardening the agar, the bottle is then extracted and filled with water. Keeping the bottle filled is arguably the most important step in the process, not necessarily in creating the bottle, but preserving it. As long as water is in the bottle, it’ll retain its shape; empty the bottle out, and the decomposition process begins as the agar starts to dry out, shriveling the container to nothingness much like the dried seaweed it’s derived from would. While the bottle is 100 percent natural and safe to drink from, some of the agar taste might leach into the water over time. Regardless of your preference to the taste, you can just as easily dispose of the bottle guilt-free as you could eat it. With that in mind, edible packaging is a pretty fascinating and futuristic concept, but it isn’t without its flaws. Admittedly, a container that begins disposing of itself the moment it’s empty could do wonders in minimizing plastic use and subsequent waste. But these containers have only been tested in small personal batches; how they’d fare commercially is a hurdle Jónsson and other edible packaging designers are still trying to heave themselves over. Simply put, packaging materials that rip like paper do not make for sound commercial liquid containers. After all, could foodstuffs contained inside effectively eat holes through the agar? What if something else outside happens to drip on the container, wearing it away? These questions (and their answers) are what product testing is for after all. Though these fragile properties might prove difficult to overcome, utilized correctly, it could yield for some interesting alternatives for plastic containers. When forming bottles that might be too thin or have holes, Jónsson can just warm up the agar, refill, and reform the mould to make a brand new bottle. Granted, the notion doesn’t do much for combating the agar’s lack of rigidity, but the idea of self- or easily-resealable packages could do wonders in their own ways for food safety. Just think: packages that revert back to their unopened, factory-packed state despite numerous uses, effectively sealing off air and bacteria better than conventional resealable bags. Jónsson’s algae water bottle is among a handful of great first attempts in finding plastic alternatives. While the technology doesn’t seek to replace plastics entirely, cutting down their industrial uses (especially in food packaging) could make a big impact in our fight to reverse the damage done to the environment. Even as we continue to poison our oceans with millions of tons of plastics waste a year, the vast seas still give us hope and the tools (that is, practical seaweed) to make things right.